I sometimes get tired of writing about Donald Trump and the GOP presidential race, but he has said so many outrageous things in the last 48 hours that the subject cannot be avoided in a serious political forum. Many people wish political commentators would simply ignore Trump as unworthy of news coverage, but failing to talk about it won’t diminish his support with the GOP base–and in any case when the leading frontrunner of the Republican Party says wildly objectionable things, it merits discussion. The problem is that it’s hard to know what to say about his statements without degenerating into what most people would view as hyperbole. Words like “fascist” and “liar” start to creep into the mind, but those sorts of sentiments are unfit for a respectable publication–and in any case, most people do not want to admit even to themselves that a totalitarian charlatan is actually leading in the GOP polls by a wide margin and is currently leading the Democratic frontrunner in head-to-head polling. But Trump’s comments over the last couple of days have been so numerous, so ludicrous and so objectionable and that’s hard to even hold him accountable. He claimed that he saw thousands of people in Jersey City cheering the 9/11 terrorist attacks, even though no such thing happened at all. After signing a pledge to support the eventual GOP nominee, he has backtracked and indicated he might run as an independent after all if he isn’t “treated fairly,” whatever that means. All of these recent bizarre episodes have already driven his only-days-old unconstitutional suggestion that Muslims be tracked in a national database out of the news, even as he prevaricates and claims he never suggested any such thing. Trump’s incessant barrage of outrageous pronouncements is reminiscent of the Gish Gallop strategy of argumentation: keeping your opponent on their heels and unable to debate effectively by throwing out so many false and misleading statements that it becomes too difficult to address any single one of them or make your own case. It’s a common creationist tactic, and a common tool of hucksters and swindlers everywhere. 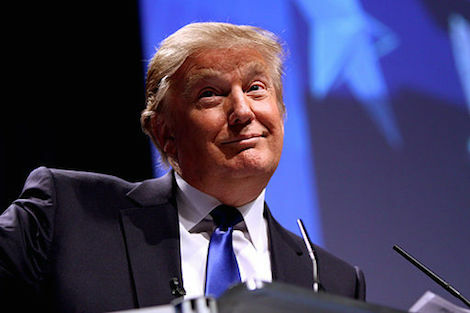 Donald Trump is doing the Presidential campaign version of it in the 24-hour media cycle. No sooner does he make one absurd and dangerous statement than he follows it up with a different one, all the while making himself the center of attention and drowning out both his opponents and the ability to effectively respond to the previous outrage. It’s sometimes hard to imagine what general election attack ads against Trump would even look like. Donald Trump isn’t an oppo gold mine–he’s more like a giant strobe-lit rave party of glittering, disorienting attack ad opportunities. One could literally fill hundreds of 30-second attack ads with his campaign statements alone, to say nothing of his personal history, and we’re still over a week from December. So where does one begin and how does one focus? Do you poll 40 of his past statements and ask people how objectionable they are on a 10-point scale? It’s actually a significant problem for writers and political professionals alike. The Republican base and conservative politics aren’t the only thing under a microscope here. We’re also seeing a test of the ability of our media and political professional class to hold a hucksterish gish galloper like Trump accountable. So far it’s not looking so good.